Our vehicles are often an extension of our personality and reflect us as people. The colour, marque, make, design, technology and modifications are important to us, and help create an image. In business, this might be even more important, as it can demonstrate professionalism and attract customers. Indeed, some modification, such as racking might be essential to the operation of the business, but it’s worth knowing limits of what is permissible for a leased vehicle before getting out your toolbox and going to work! Can I install a personalised plate on my vehicle? The short answer is probably yes – but it might take a little work. There are more than 45 million registrations available to buy online and many of us have been tempted to buy one to reflect our personality or brand. Therefore, we almost certainly will want to take that plate across, if we sell our own vehicle and select a lease rental instead. Firstly, there is a difference between having a new plate made, and transferring one from an existing vehicle. To have one made, you’ll first need to purchase it from the DVLA and then take the proof to a registered number plate supplier, who will create the plate to the correct legal standard. You then need to obtain permission from the lease company, and this will vary from company to company. They will process the swap using the vehicle’s V5 certificate. You’ll need a Certificate of Entitlement (V750) and to arrange for the lease company to be named as a nominee, and to pay an admin fee of around £35. If you have any questions about the full process, then it’s worth contacting your lease company to discuss them beforehand. There’s no real reason why you couldn’t potentially transfer plates to several lease vehicles, should you wish to do so. At the end of the lease you will need to arrange to have the plate removed yourself. One of the best ways to advertise your company is on the side of your vehicles as you travel – but what if you don’t own them? Most lease van companies allow you to brand your vehicle, providing you can remove the branding/decals before you return it. Therefore, getting a complete respray of the vehicle is probably a big no-no! Instead, better options might be to use magnetic signs that can be simply removed, or temporary vinyl graphics for a large van which can be altered for different promotions. Both of these options can be largely configured to incorporate specific colours and designs, and are available in many different sizes. Most lease companies offer vehicles with a large degree of customisation. For example, at Lease Van there are many different colours available for our vans, from Volcano Red to Graphite Grey, and a huge number of optional extras. It’s a far easier process for us to fit these extras, rather than the lessee. Some small modifications might be permitted by the funder, but this is usually at the driver’s own risk and might invalidate any warranties. As an example, some of the extras available on vehicles include driver aids, door modifications, different exterior lights (LED lights etc. ), cloth trims and alloy wheels. Each of these confer an extra cost, but if you’re happy with that there’s no reason why they can’t be installed on some or all of your fleet. It’s purely a stylistic matter of taste, but one might want to shy away from personalising each and every one of the vehicles individually! Many leaseholders will want to modify the interior of their vans, to provide specific racking, or perhaps have a tow bar fitted. Again, contact your lease company beforehand to arrange this – they will advise if they can carry out the task, or how it should be done. 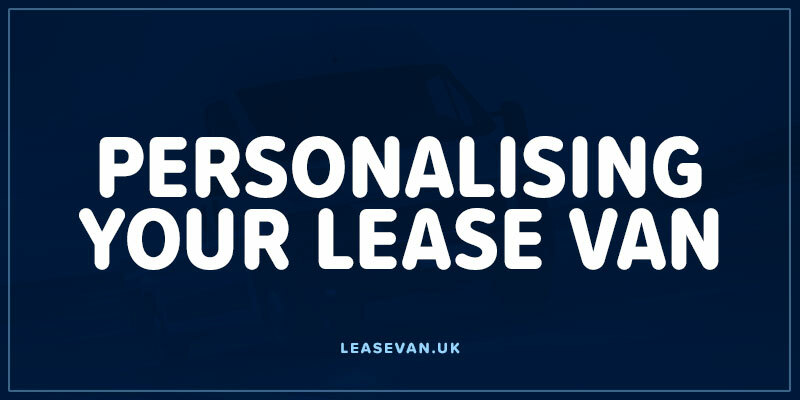 If you have any concerns about the vehicles you are leasing, and what level of personalisation you require, then get in touch. Some modifications might not confer any cost while others can be assimilated into the rental, so it’s worth checking. In conclusion: it’s much easier to speak to someone than just assume you can or can’t do something.